General Ipoola Alani Akinrinade has said that the fight to keep Nigeria as a single country is futile and that the Igbos agitating for Biafra should be allowed to go. 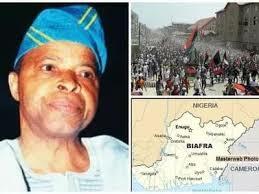 In an interview with Vanguard, the Biafra war veteran said although he still believe a true federal system is good for the country, the current structure made the war to keep the country as one looked futile. He said: “Good, you allow people to make choices. And you also said it is good to allow people decide their fate. This present agitation by the Igbos, garbed in the Biafra movement, in retrospect, wouldn’t we now begin to admit that the fight to keep Nigeria one, based on contemporary realities, was futile, a fool’s errand, that was not worth it? Those ideals that people had, in keeping the nation one, appear to have been thrown out of the window. “Well, I think as far back as the early 1980s, I’d alluded to the fact that it is still possible to keep a country like Nigeria one. I still have that belief. “Maybe because some of us have served everywhere and we have friends everywhere and we talk and discuss and share views. As far back as 1983 when I went to Ife to deliver a lecture, I suggested that we would do much better with a confederation. There were quite a number of things I also said there. Because, there, I made it clear that the way free education was being continued, it was not going to survive or give quality education, that it needed remodelling. Those who had made good and were expected to pay back to society were still hinging their hopes on free education. That was not fair. When you have benefitted and can afford to offer at least 20 scholarships, you still want to keep your wealth made through free education and you want your children to also participate? On top of that, you add bursary. Are you going to give bursary to children of people in my social category? It would be unfair on the farmers and those in dire need of the bursary. So, because my father married five women, I should now marry six because I appear to be a bit more comfortable? The society will not grow like that. Somebody has to apply the brakes and fine tune things. "I believe a confederal system is more manageable. On the issue of corruption and its fight, general Akinrinade said the current method would not work as the structure of the country breed corruption. "It is simply because we are poorly organised. That is not the fault of Buhari. But it will be his fault if he did nothing about it. So, this idea of shying away from a wholesale look at how we are organised for these tasks ahead, simply because it is tedious and difficult, then we are not serious. “Let me tell you what breeds corruption: You cannot, for instance, as minister of agriculture, sit in Abuja, and ask people to apply for or show interest in a scheme like ranching. Do you know how big Nigeria is? Are you going to start driving round Nigeria to inspect? This is just one of the things open to abuse. Just this week (last week), a young man came to meet me in the farm and asked to be assisted with a tractor to work on a farm land; that he had just gotten approval for a N30,000 per month allocation – a Federal Government scheme. He said his wife too applied and got. So, if they had a grown up child, that, too, will benefit. I tried assisting him but I told him it would be better if I helped him negotiate with the owner of the tractor that was being used on my farm. I was interested in helping him; so I took him in my car to the owner’s place. When we got to the owner’s place, that one requested to see the farm; and I was still prepared to help drive him to that farm so he could show it to us. It was then he said we should give him some few more days so that the farmland he wants to use would be made available – by the original owners. “Now, the point I’m trying to make about corruption and the way we are organised is that you say you want to give people money to farm for a year or two – N30,000 per month – yet you sit in Abuja. How many people like him do we have in the country? How many more people’s names would be added who are not even existing. That is how government allows the system to become corrupt. The remoteness of government to the people breeds things like this and it fits into the issue of restructuring. Beautiful idea no doubt. But the system you are using has failed from the beginning. You have an outfit called SUBEB; it is based in Abuja. So they say they must have branches in every state. What are they doing? They are supposed to be building schools, primary schools-o, in every state. Why should that be? This is money coming from the purse of all of us.